Since entering the market in 1996 Alperstein Designs have emerged as a top manufacturer of Aboriginal themed lifestyle products and homewares. They pride themselves on quality and their point of difference is the original and innovative beautifully made products with rich Aboriginal heritage. This beautiful, silk scarf is based on the artwork of Murdie Morris who is famous for her colourful, acrylic paintings and limited edition prints. All of the royalties from these products directly benefit the artists and their aboriginal communities which means you are giving back to a positive cause. Made of 100% silk, and velvety to the touch, this scarf stands out with its vibrant colour and is a fabulous addition to any woman’s closet. 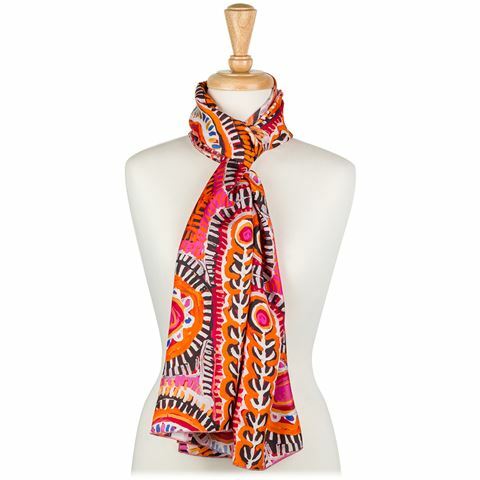 To not only wear such a luxurious and elegant scarf made of beautiful fabric but also helping the aboriginal communities, you’ll feel so great wearing this piece you may never want to take it off. Based on the artworks of Murdie Morris. From artists based in Yuendumu. All royalties from scarves sold directly benefit the Aboriginal community. Velvety soft and a fabulous accessory.